American sterling silver large Pond Lily napkin ring by Gorham Silversmiths, c.1890. This ornate napkin ring features wide borders of applied Pond Lilies and is marked B209. Weighing a substantial 45 grams or 1.4 ozs. 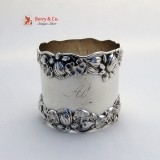 Troy, the napkin ring is 2" in diameter, 1 7/8" tall and is inscribed, in ornate, period script Al. Inscribed as described above, the soft, warm, original finish is present, with no buffing or machine polishing. The excellent original condition and clear detail, with no removals, repairs or alterations, make this an especially attractive offering. American coin silver sugar bowl with Lion Masks, sitting on three lion paws, c.1815. Unmarked, but similar examples by William Thomson of New York City. 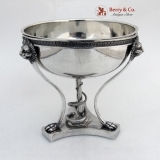 This elegant 1st Empire period bowl is 5 3/8" tall, 4 7/8" in diameter and weighs 400 grams or 12.9 ozs Troy. Monogrammed AL. The excellent original condition with no removals, repairs or alterations, make this an especially attractive offering.